There many types of cat toys you might have seen on TV which is commercialized every ten minutes. While thousands of those toys may have been sold, however there are some all time favourite toys that are so called the “best selling ones” these are none other than Mice, mice and mice!! If your cat has been part of your family for a while, you might want to hit the entertainment department for your cat. Mice just never seem to fail at making your cat wanting to play with. In case you’re getting a new kitty, you need to consider and include some of the necessity for the preparation of his/her arrival. So, here the bell rings for “cat toys”. 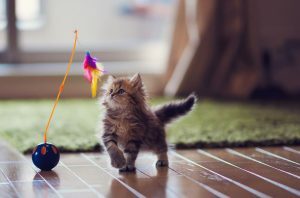 Wirth a new cat or kitten, you don’t yet know the presence of your fur baby, therefore it is best to get a variety of toys and decide which type of toys they like the best. Cat seem to like mice than other toy types, this is because of their natural instinct to hunt mice. The overall best selling cat toys is the toy mouse that is itself not so simple. Cat toy might come in varieties of ways that might make your head spin for a while, now, there are tiny mice, realistic mice, mice that rattle, some have natural, bright colours, yarn mice, corded mice, yarn tails, tails with bells, corded tails, furry tails, long tails, some have catnip inside, and many more. Your kitten needs a mixture of toys, mice, balls on a string and battery powered toys and getting your new fur baby assortment is a plus point, this lets them choose what type of toys they like the best. Once your cat shows the preference to the type of their liking, you can seek for brand name and other variations of the toy. For ex: if your cat like mice, you could literally render a hundred variety like bright coloured or real looking mice, small and large mice, rattling mice, plush mice bells or rabbit fur, mice with features. After this, you kitty decides which ones sounds best for their liking. This may seem quite simple and unappealing to human eye, but cats don’t seem to tire of swiping things with their hunting small pieces of fur and paws. Of course, a cat’s natural instinct is to hunt and stalk and so for your cat to spend all day indoor, he/she might find outlet for these tendencies. This is another relatively inexpensive option that is just well and can easily let your cat get lost. However just like the wand, a ball allows them to exercise pouncing and hunting instinct. Typically, most cats prefer balls that make some noise or even jungle. Now, playing with a ball is a simple game and can be played single. This makes your cat to be stimulated while you are out and also you can join in when you are at home. To speak the truth, a cloth toys that does nothing will not entertain your cat for very long time. Generally a cat prefers toy that moves and so if you’re about to buy small cloth toys you need to consider it catnip. This is highly recommended for you so that when cat looks at catnip toys they may consider it refillable as the scent will not last long. These types of toys can be brought at a cheap price and so you may find it less time consuming to buy new toys rather than fresh catnips. There are some other toys too which are recommended for you; one like the coiled spring. This is a wonder toy for swiping and batting and you can find some scratching posts that have these kinds of toys attached. It will feel attractive to cats and will definitely encourage them to use the spring toys as well as scratching post. Laser pointers are some of the latest cat toys to immerge and can appeal as per the individual temperament of your cat. Those who enjoy laser points will really love them for long time. On the other hand, there are some cats who don’t like laser pointers as interesting. One goodnews is that this can be bought at an affordable price and so it need not cost a fortune to discover whether or not it seem like fun. As an owner you must know the likes and dislikes of your cat. Either its mice, laser points, scratching posts or any other thins, you must train them to get used to it and help them spend long house with their toys. These playing toys will really keep their mood happy and enjoyable for long hours.